100 ml polymeric bottle with mechanic dispensing pump. Does not colour hair and ambient objects. Creates a protective layer non-inhibiting dermal respiration to prevent external microorganism intrusion into a wound. Kills pathogenic microorganisms resistant to other drugs. The drug contains 0.015% miramistin, 2% camomile extract, 0.1% chitosan succinate and 8% ethanol as active ingredients. 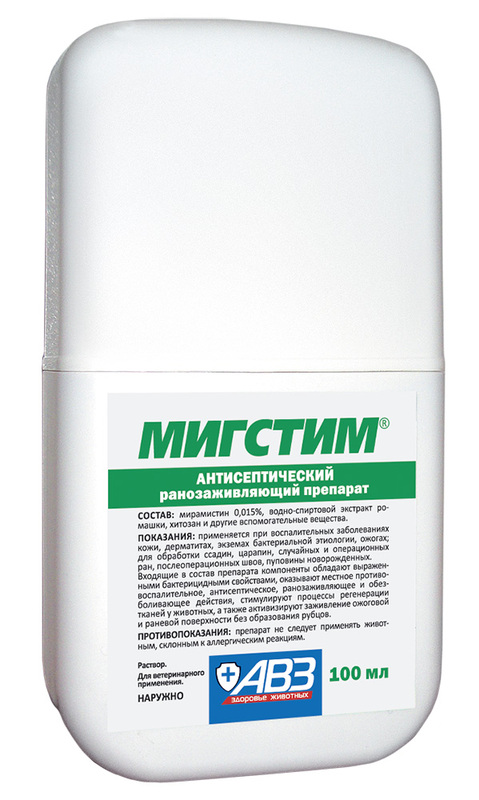 Migstim (combined antiseptic drug) is active against most gram-positive and gram-negative pathogenic microorganisms (including Pseudomonas aeruginosa, Staphylococcus aureus, candida and chlamydia). Active ingredients of the drug have frank antibacterial and anti-inflammatory properties, promote reparative processes and immunocompetent cell functional activity providing immunomodulatory effect on pathologic lesion. Activation of healing of wound or ambustial surface is observed without excess scarring. Inflammatory bacterial skin diseases, eczemas, ambustions; processing of scratches, racomas, occasional and surgical wounds, postsurgical sutures and newborn funicle. Contraindicated for animals prone to allergic reactions. Prevent eye contact with the drug during processing of affected areas in the region of head. Before administration remove dirt, wound exudate, necrotic tissues and pus from affected surface. Apply Migstim with sterile gauze pad on the affected surface engaging 1-2 cm of healthy skin or spray it from a distance of 15-20 cm pressing dispensing pump within 2-3 seconds. Perform a processing twice a day within 7-14 days. Process newborn funicle, scratches, racomas and surgical wounds with a single dose to prevent wound infection. Use drainage steeped in the drug to treat deep wounds. Do not use drainage for more than 6 days. Store in closed original package far away from heaters and open flame. Protect from light. Keep out of the reach of children and animals. Store separately from food and animal feeding at 0-30°С. Shelf life is 1 year from manufacturing date and 1 month after unpacking.